It dawned on me today that I’ve been back almost a week and hadn’t posted anything about my trip. I went down to Orlando again this year for work. 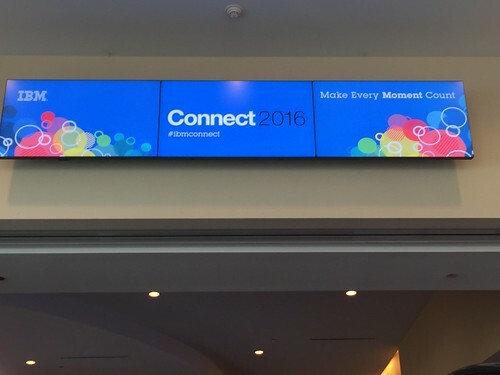 Five of us headed down to attend IBM’s Connect 2016 conference (formerly known as Lotusphere). This year’s was held at a new venue, the Hilton, and the atmosphere was much lighter than last year’s. Last year had really felt to me as though many attendees were in mourning, because we all believed that it truly was the end of Lotusphere. Disney World holds bad memories for me, so the idea of a new venue was appealing. This year, the air was decidedly lighter, and charged with hope and excitement. I remarked to one IBM staffer that everyone I encountered actually looked happy to be attending! It had its differences from previous years’ events. There was no backpack. That really bummed me out because I’ve enjoyed getting those and repurposing them. Though I was very glad that I took the BatPack with me again this year. There was no event book like in previous years. Instead, there was the Connect 2016 newspaper. While full of helpful info, it’s big and stayed mostly folded up at the bottom of my backpack. I had taken time to add the sessions I wanted to my calendar before going down there, so that helped me to keep up where I needed to be when and such. Also, they gave us each a selfie stick at registration. I asked one of the staffers if I could beat users with it instead. She laughed but looked at me REALLY funny after that! I saw friends I had made at previous Lotuspheres (Connect 2014 and ConnectED 2015), as well as some I met last year at MWLUG. I made a few new friends and am looking forward to seeing them (hopefully if we go!) to this year’s MWLUG and/or next year’s Lotusphere. I didn’t take as many photos as I should have, but I have a few online. I truly enjoyed the content of the sessions I attended. I made the comment to a vendor that even though I’m still relatively new to the community, I didn’t feel as much like a newb than last year and the previous (my first) year. I know enough to ask half-way intelligent questions and I’m able to note things discussed in sessions (or in passing) that we could implement at ibml. I emailed a copy of all of my notes to myself to transfer into Connections for several activities that I have assigned myself. Projects and projects and projects to do! Have you ever been happy to give yourself more work? Wheeeeeeeeeeeeee! I am. Yeah, I know, I’m weird. Donna had been watching Bruce and Selina for me, and both babies were very happy to see me when I got home. Apparently Bruce had been a bad boy for her, but as soon as he heard me, he came running, meowing loudly, and loving all over me. Who says cats don’t miss their human? Mine do! I was sad to be leaving Orlando, but I have to admit, it’s great to be home! (though I could do without all this cold stuff!) I’m still playing catch-up at work, but I’m excited because I have finally finished one project and am about to start on another. We have upgraded all of our users’ Notes clients to the latest version, and I’m researching the best way to keep us up to date, upgrading about every 60-90 days. (unless of course major vulnerabilities are brought to light and we have to update sooner) We also have a Connections upgrade coming and I’m looking forward to seeing that since we’re going from 4.5 straight to 5.5. Our Domino servers are pretty much already up to date. A few still need the latest fix pack, but that’s nothing major, I just need to make time to schedule the downtimes needed. I’m also happy to be busy. Nice to know there are a few of us. 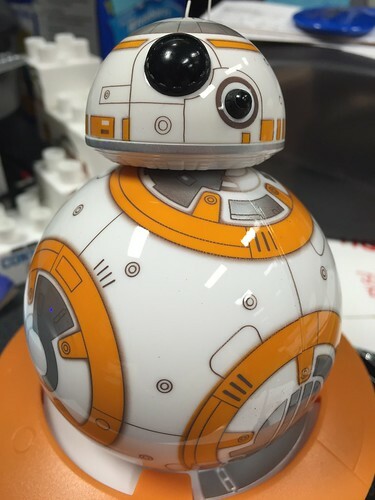 I’m so jealous of the BB-8. Want to sell him?